Picture vast landscapes, snow capped mountains and burbling streams. Fresh air, lack of noise, and in front of you… No one, not a single soul. Out on the trail, you feel free to push your body, the crunch of the leaves underfoot as you climb another ridge. Basking in the glory of the runners high, you start back down the trail and then you feel it… Drips of water. As it increases in intensity, the rain brings with it high winds and lack of visibility. Your car is in the carpark 40 mins downhill, you’re cold and the trail is getting hard to see. Some days the trail is not your friend. Mother nature can behave like a 3-year-old throwing a tantrum, and if you are not prepared, you can quite literally, run your day into the ditch. So what equipment is needed to stop your day falling to pieces? Below, we break it down into four chunks. The tips and equipment are meant to ease your entry into the man vs wild world of trail running. 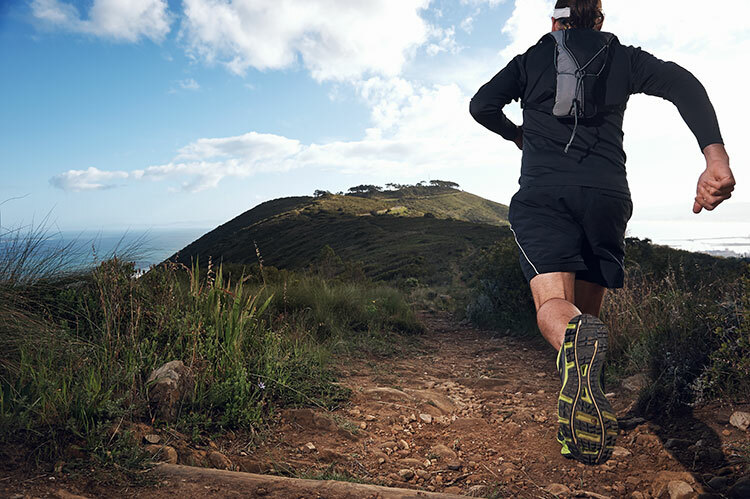 Safety should be your primary concern when trail running. Where possible run with a friend, if something goes wrong you have someone on hand to help. Don’t know anyone else that likes to run on dirt? There are 5.8 million trail runners in the US and the sport is growing at a rapid clip. Search for a local trail running club or harrier group and make it a social affair. Do your research and plan your route, most areas now have trail maps and information available online. Try The Trail Run Project or Trail Link to search by state or city and take a printed copy of the map with you for reference. When starting out you will want to allow double your normal running time over a similar distance. This takes into account terrain, changes in weather and a few stops to take in the view. Always carry a charged phone with a waterproof case so you can reach help if needed. A basic first aid kit consisting of a compression bandage or athletic tape to strap a rolled ankle or knee. A blister kit of bandaids, alcohol wipes and antiseptic cream, sunscreen and a whistle. You also need to plan for rain. Heading into the hill’s it can get cold and wet fast, so a waterproof shell is essential. Patagonia, The North Face and Pearl Izumi all have lightweight rain jackets that pack small. Your body uses more around 10% more energy running trails than road, so plan your energy and hydration in advance. For trail runs under an hour, a simple handheld water bottle should suffice. If you want to go further or tackle terrain that requires the use of your hands, consider a hydration pack or belt. Nathan Sports and Ultraspire make some of the best on the market, and all are designed for trail running. When your body needs fuel to burn, there are two different approaches. Liquid nutrition has come a long way in the last few years, companies like Tailwind Nutrition can now provide everything your body needs for up to twelve hours of running in liquid form. It’s a really easy way to measure your calorie intake, and it’s as easy as drinking water. Altra Running’s Superior 2.0 have removable stone guards to protect the soles of your feet and feature cantered lugs on the outsole to provide better grip across varied terrain. And they have a breathable upper, designed to let water out of the shoe after plunging through that water. Other good brands include Salomon, Hoka One One and The North Face. Socks – Right up there with a good trail shoe is purpose built socks. Trail running is all about getting out into nature and that means puddles, streams, mud and more puddles. When starting out, runners often look for the ultimate waterproof shoe but that is misguided. In trail running, your feet are going to get wet. Period. Your best defense is a sock designed for the trail, combined with a good trail shoe. A merino wool sock like the <Icebreaker Merino Compression or the Injinji Mini-Crew help wick the water away from your foot, keeping it comfortable even through the streams. Another tip is to rub a little Vaseline between your toes if you know its going to be wet to prevent your sock chafing your skin. Avoid cotton as it will hold onto the moisture. Base – A good base layer should consist of a light but warm t-shirt in summer and long sleeves in the winter, again avoiding cotton, go for a fabric that breathes. These tops from Patagonia and Ultra-Runner will keep you warm in the winter, cool in the summer and will wick the sweat away from your skin. Best practice is to layer t-shirt or vest, and add a long sleeve on cooler days. A good hat and sunglasses are essential and a buff can triple as a bandana, a headband and can be used to mop up the sweat on the hotter days. Gaiters – These are definitely a personal choice item. Some runners swear by them as a way to keep the stones, mud and sand from getting into your shoes and doing damage. But they can be tricky to attach and trap a lot of moisture and heat in your shoe which can lead to overheating. Poles – If you are out amongst the rolling hills of West Virginia poles are just going to be excess weight. However, if you’re hitting the mountain ranges of Colorado, they can provide support to your knees and ankles and help your posture when climbing. They keep you balanced on technical descents and spread the load off your legs. Poles are another personal choice item often dictated by what trails you run. Black Diamond has a good selection of lightweight folding poles that snap into supports on most Hydration Packs when not in use. Click here for our full list of the best trekking poles for the money. Headlamp – A headlamp such as the Black Diamond Sprinter is always a good addition to your kit. Try to make your way over rocks, roots and unstable ground in the dark, not smart thinking. GPS Watch – This is starting to get into the realms of Ultra-Running but they have a lot of great features. On top of plotting out a run from downloaded coordinate’s. A GPS watch will track the miles you cover, your altitude and your heart rate, see the Garmin range here. And most important of all, common sense! If you drive an hour out to your favorite trail only to observe stormy clouds coming from the other direction. It’s ok to head to the nearest township for a quiet coffee in the country rather than risk getting caught in a situation that could see you in danger. Look after yourself and have fun on the trails. This is a guest post by Jess Farley, a New Zealander who is an avid trail-runner having just completed the Vietnam Mountain Marathon, a qualified diver and currently on Koh Samui hiking, kayaking and snorkelling before heading to Japan for the Snow Season.